It looks like another piece of Star Trek technology is just around the corner. 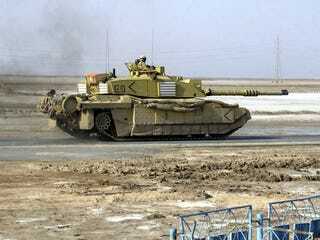 The British military's top scientists are using supercapacitors to create deflector shields for tanks. Researchers at the British military's Defence Science and Technology Laboratory want to use supercharged electromagnetic fields to repulse attacks on tanks and other combat vehicles. Supercapacitors built into the armor of these vehicles can store huge amounts of energy, which would then be deployed when an incoming threat is detected. The field would theoretically be powerful enough to deflect pretty much anything up to small missiles, and the supercapacitors would be able to quickly recharge to prevent a subsequent attack. The supercapacitor material can be charged up and then discharged in one powerful event to repel incoming fire. You would think this would require huge amounts of energy, but we have found it can be done with surprisingly small amounts of electrical power.Conventional armour is just a lump of metal but an RPG round can punch through more than a foot of steel. Carrying around enough armour to protect against that is extremely heavy. The real advantage to the electric armour is how light it can be by comparison. The real issue is one of timing. The electromagnetic field created would only last for a fraction of a second, so it would be absolutely critical to deploy the field at precisely the right moment to repel the attack. Turning this new technology into a reality on the battlefield will likely require the development of advanced tracking systems that can gauge the exact instant to fire up the field. In the meantime, the scientists at the Laboratory are continuing to develop the basic technology, something they've been working on throughout the last decade. As early as 2002, they were able to use a relatively primitive version of the electrical armor to protect a jeep from repeated blasts from an RPG, ultimately driving the vehicle away with only minor scratches. The current goal for the research team is to perfect the technology and reduce the weight of armored combat vehicles by an astounding seventy percent by the end of this decade.